The wood mouse (Apodemus sylvaticus) is a common and widespread species in Europe and therefore often used as a focal species in the risk assessments of pesticides. Recent years have seen a growing interest in the use of ecological models in ecological risk assessments. The purpose of this PhD project is to construct and apply population models of the wood mouse to support risk assessment of pesticides. 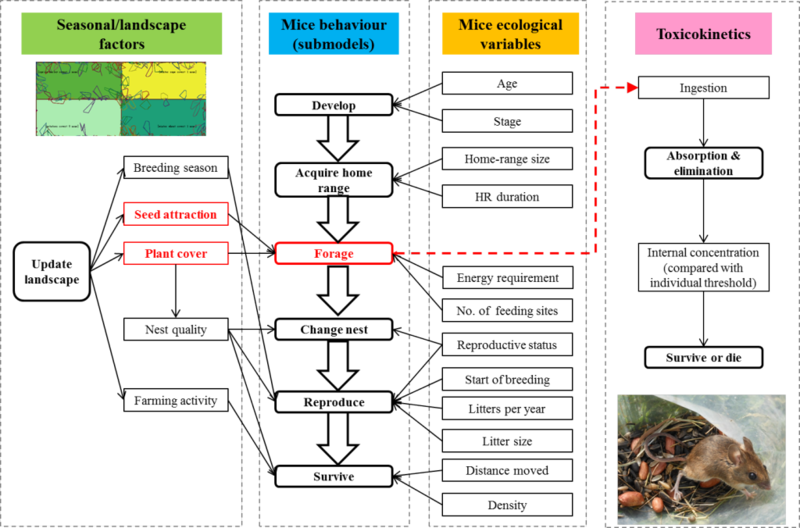 Following a modelling cycle (Schmolke et al., 2010), the PhD project started with a literature review of the basic ecology of the wood mouse and relevant information for modelling purposes. A conceptual model (Figure 1) was then constructed, based on which individual-based models (IBMs; Grimm and Railsback, 2005; Railsback and Grimm, 2012) were developed. The models take into account factors such as life-history traits (e.g. breeding pattern, dispersal), behaviour (e.g. foraging, movement and territoriality), pesticide application patterns (i.e. where, when and how much) and its interaction with other agricultural practices (e.g. ploughing, harvesting), physiology (e.g. absorption and elimination of toxicant) and mode of action (e.g. effects on survival and reproduction). The stepwise development of the model aims to (1) link pesticide exposure to the spatial choice of the individual mice (2) explore the added value of incorporating toxicokinetic (TK) processes to the spatial choice simulated by the IBM, and (3) explore the elasticity of the population size and population growth rate to effects on survival and reproduction. Figure 1. Overview of model processes (bold boxes) and key variables (normal boxes) in the wood mouse IBM. The model has four main components: the landscape, mice behaviours, ecological factors controlling behaviour changes, and toxicokinetics. Wide arrows indicate the order of processes and thin arrows indicate influences. Red font shows key process and key variables for risk assessment. Exposure is dependent on the foraging choice (red dotted arrow) of the mice. When TK processes are considered, exposure is expressed as internal concentration. The landscape structure with four crop fields plus hedgerows and the home range polygons of the mice are shown in the left-most panel. Adapted from Liu et al. (2013). The model was thoroughly described and its ecological credibility was evaluated by the “pattern-oriented” validation method (Grimm et al., 2005). The model was then used to link the spatial choice of wood mice and their potential exposure to pesticide application in the field (Liu et al., 2013). Analyses of the model showed that when the population density reached a high level in the off-crop hedgerows, which act as the source habitat for wood mice, the surplus were driven to the crop fields and thus have a high risk of exposure if pesticides are applied. The model was further developed by incorporating a sub module of toxicokinetic processes which represented exposure as internal concentration instead of ingested dose (Liu et al., in press). The interactions between the spatial patterns of foraging provided by the individual-based model and the temporal patterns of absorption and elimination provided by the toxicokinetic model were explored. The combined model showed little further reduction of risk than either of the two models respectively alone. It suggested that such a combined approach is most likely to bring added value when the spatio-temporal patterns of feeding are at the intermediate level, i.e. when mice divide their foraging between exposed crop and unexposed areas. The model was then used to explore the population-level sensitivity in terms of both population size and population growth rate, to detrimental effects on individual-level life-history traits. The results showed the two indices had different sensitivities to changes in life-history traits. Thus, endpoint from the models used in risk assessments should take into account whether the protection goal is to ensure that the population remains stable or that it grows. These studies serve as a good example of how mechanistic effect models such as IBMs can be used to address a variety of questions with more realism and ecological relevance in risk assessments. Liu, C., Sibly, R.M., Grimm, V., Thorbek, P., 2013. Linking pesticide exposure and spatial dynamics: An individual-based model of wood mouse (Apodemus sylvaticus) populations in agricultural landscapes. Ecological Modelling 248, 92-102. Others: the wood mouse model has been used as example/case study in the SETAC short course “Introduction to population models for ecological risk assessment and their documentation using TRACE” (May 2012, Berlin), in the SETAC EU “MODELINK” workshop (Oct 2012, Le Croisic; Apr 2013, Monschau), and in the SETAC winter school “Mechanistic Effect Modelling for Ecological Risk Assessment of Chemicals” (Jan 2013, Leipzig). Grimm, V., Revilla, E., Berger, U., Jeltsch, F., Mooij, W.M., Railsback, S.F., Thulke, H.-H., Weiner, J., Wiegand, T., DeAngelis, D.L., 2005. Pattern-Oriented Modeling of Agent-Based Complex Systems: Lessons from Ecology. Science 310, 987-991. Grimm, V., Railsback, S.F., 2005. Individual-based Modelling and Ecology. Princeton University Press, Princeton. Railsback, S.F., Grimm, V., 2012. Agent-Based and Individual-Based Modeling: A Practical Introduction. Princeton University Press, Princeton. Schmolke, A., Thorbek, P., DeAngelis, D.L., Grimm, V., 2010. Ecological models supporting environmental decision making: a strategy for the future. Trends in Ecology & Evolution 25, 479-486.